What is biodiversity and what does it mean to the average diver? Biodiversity is a measure of the variety of species that can be found in an ecosystem. 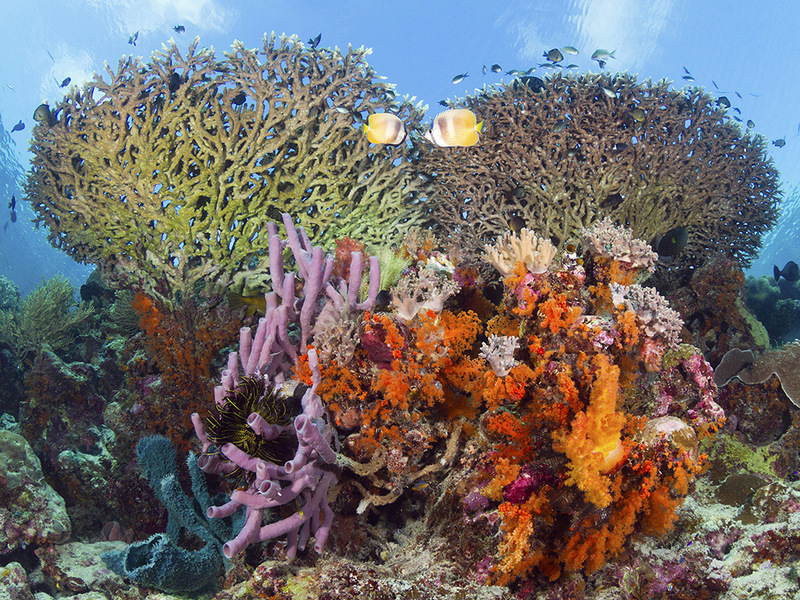 Wakatobi is located in an area that encompasses the highest coral reef biodiversity in the world. But why it so prolific in our part of the world, and what does it mean to the average diver? Many factors determine the overall number of species in an ecosystem. Historically, for instance, the region bordered by Indonesia, the Philippines and New Guinea was never severely affected by two great ice ages which caused mass species die-offs in other regions. For this reason, the region is considered to be the epicenter of coral reef biodiversity. 85% of the world’s coral reefs are located in the Indo-Pacific region, and as you travel either east or west from the epicenter of biodiversity, the number of species decreases. At the Western edge of the Indian Ocean, or the Eastern edge of the Pacific, you will only find about 25% of the number of species that are present at Wakatobi. The Atlantic/Caribbean region has even less diversity, less than one tenth the number of species found in the Indo-Pacific. For instance, the Atlantic/Caribbean region has fewer than 70 species of corals while the Indo-Pacific has over 700 species. Today, all seven species of sea turtles (Green, Kemp’s ridley, Olive ridley, Hawksbill, Leatherback, Flatback and Loggerhead) are either critically endangered or threatened all around the world. 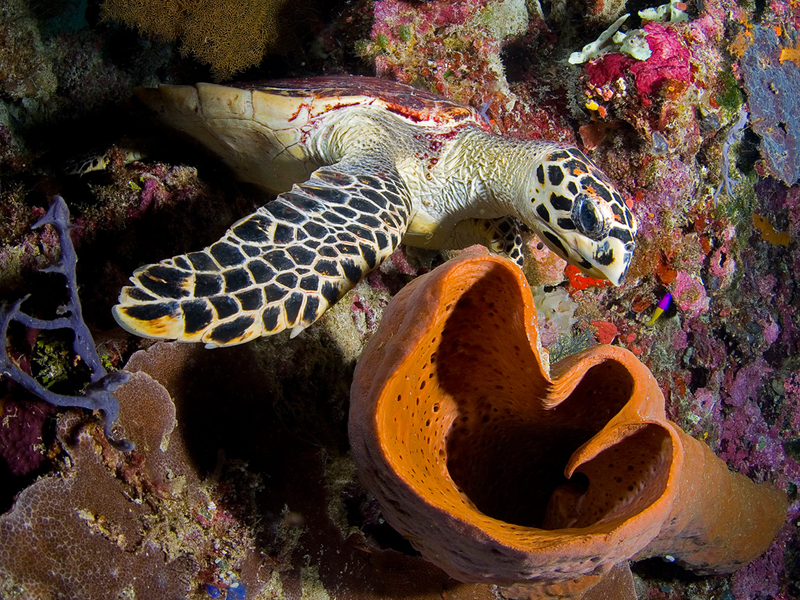 At Wakatobi Resort you will find sea turtles on almost every dive. The environment also influences biodiversity. Coral reef ecosystems need warm, clear waters to thrive. If there’s too much runoff from large rivers or urban growth nearby, the reefs can be choked by siltation or pollution. The waters must be warm, but not too warm. Below 25 C, coral growth is retarded. Above 29 C, the symbiotic algae living in the corals begins to die off and stress the corals. Depth is important too. Very shallow waters have too much temperature fluctuation and disruptive wave and surge action. Too deep, and light is diminished, which decreases diversity. At about 20 M depth, there is plenty of light, and not much wave action, even during large storms, so more species can survive. Why is biodiversity important for divers? That’s simple. When you go on a dive vacation, you want to see lots of stuff. But you don’t what to just see lots of the same stuff all the time. A biodiverse reef in pristine condition lets you see more species with less effort. If you are interested in seeing and learning about the most biodiverse coral reef region in the world, it’s time for you to start planning a trip to Wakatobi! Learn more about diving at Wakatobi Resort by contacting our office at office@wakatobi.com or complete a trip inquiry at wakatobi.com. A guest experience consultant will be in touch with you to answer any questions and discuss your next dream dive vacation.